Samsung recently made official its new touchscreen mobile phone, named Samsung Caliber R860.The new Samsung Caliber (SCH-r860) Phone is available through MetroPCS and also is available at US Cellular. The all new Samsung Caliber R860 phone comes equipped with a 3.2-inch WQVGA touchscreen TFT display and features GPS with MetroNavigator, Samsung’s TouchWiz UI, 3MP camera with flash, MicroSD memory card slot that can support up to 16GB memory.The new Samsung Caliber R860 supports networks includes CDMA 1×800 MHz/1900 MHz, EVDO Rev 0, AWS Band 1700/2100 MHz. The new Samsung Caliber R860 phone features full HTML web browser, Customizable Widgets, E-mail and Mobile IM applications, Bluetooth, advanced voice recognition, Metro 411 Directory Assistance, integrated popular social networking site such as Facebook or MySpace. Samsung Caliber R860 phone is housed with 1080 mAh Lithium Ion battery that provides a battery life of about 4.5 hours in talk time and about 300 hours of standby time.The handset weighs 3.74 ounces and its dimensions are 2.2×4.5×0.47 inches.The new Samsung Caliber (SCH-r860) mobile phone is available through MetroPCS for a price of $250 without contract. Tags:-Caliber, Caliber (SCH-r860), Caliber r860, MetroPCS, Samsung, Samsung Caliber, Samsung Caliber (SCH-r860), Samsung Caliber r860, Samsung Caliber R860 phone price, Samsung Caliber R860 phone availability, Samsung Caliber R860 phone features, Samsung r860, Samsung r860 Caliber, Samsung SCH-r860, Samsung SCH-r860 Caliber, Samsung touchscreen phone, SCH-r860. 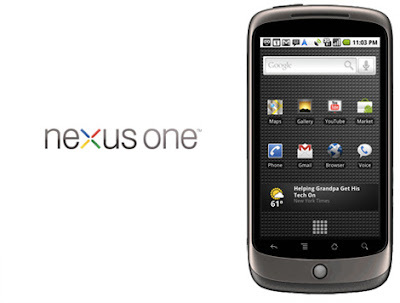 Nexus One to Vodafone UK by April? The Telegraph recently reported that the Google's Nexus One handset will be soon available in UK market by April.The Nexus One will arrive through Vodafone which will be saled through Google.com/phone only, as announced by the company.The official announcement in this matter is yet to be made.The new also said that the expected price is comparable to other smartphones.The two giants, Google and Vodafone only announced that the new Nexus One will be delivered in UK by spring this year. 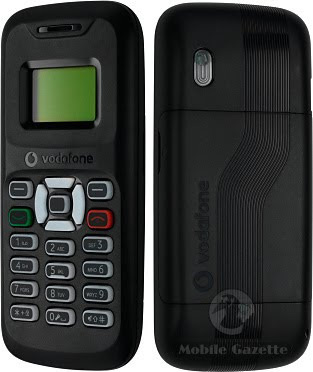 Tags:-Nexus One recent updates, Nexus One to Vodafone UK details, Nexus One availability in UK, Nexus One UK launch, Nexus One through Vodafone. Sony Japan recently announce its all new portable navigation device (PND), named Sony NV-U35.The new ony NV-U35 can also be used as a music and video player that supports formats including MP3, AAC, eAAC+, WMA and ATRAC (audio), MPEG4 and WMV (video), as well as JPEG (graphics). 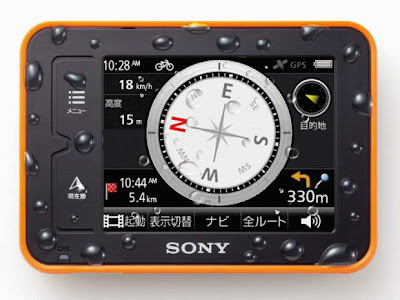 New Sony NV-U35 Navigation device comes equipped with 3.5-inch touchscreen LCD display with a resolution of 240×320 pixels (QVGA) and housed in waterproof chassis that meets IPX5 industry specifications.The new Sony NV-U35 GPS Navigation device is also included with 8GB internal memory, a Memory Stick Pro Duo card slot, USB port, a 1W mono speaker, a digital compass, and CYCLOCOMPUTER. 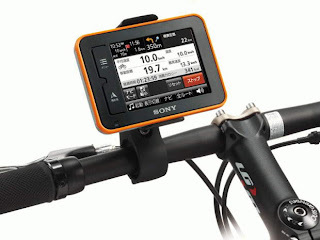 Sony NV-U35 also packs a special attachment that allows navigator stand on bicycle handlebars (see photo). 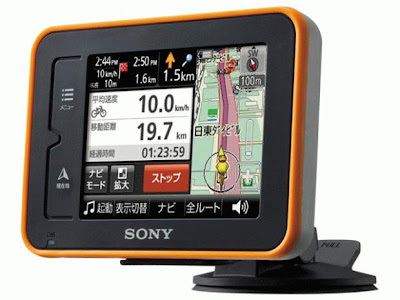 Sony NV-U35 GPS Navigation device weighs weighs 176 g and its dimensions are 112×17.8×79 mm.The new Sony NV-U35 GPS Navigation will come to sales by March 13 onwards in Japanese market with a price tag of about $410. Tags:-Sony NV-U35 GPS Navigation Device features, Sony NV-U35 GPS Navigation Device details, Sony NV-U35 GPS Navigation Device price, Sony NV-U35 GPS Navigation Device launch, Sony NV-U35 GPS Navigation Device availability, Sony NV-U35 GPS Navigation Device introduction, Sony NV-U35 GPS Navigation Device price tag. Asus recently started the sales of its two new laptops with NVIDIA Optimus technology, named Asus N61JV-X2 and Asus N71JV-X1.The NVIDIA Optimus technology enables switchable graphics solution between a dedicate and integrated Graphics.Both the new Asus N61JV-X2 and N71JV-X1 Notebook also features USB 3.0 ports. Asus N71JV-X1 notebook comes equipped with a 17.3-inch display with 1600×900 resolution and is boosted with a 2.26GHz Intel Core i3-350M processor.The notebook weighs 9.30 lbs and its dimensions are 18.40 x 12.40 x 1.80 inches. 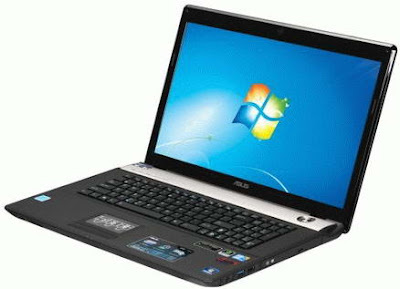 Asus N61JV-X2 notebook comes included with a 16-inch HD LED LCD display with resolution of 1366×768 pixel and is powered with a 2.26GHz Intel Core i5-430M CPU.The notebook has a dimension of 15.4 x 10.6 x 1.5 inches and weight 6.5 pounds. Both the new Asus N61JV-X2 and N71JV-X1 Notebook comes housed with a dedicated NVIDIA GeForce GT325M GPU with 1GB of VRAM and integrated Intel HD graphics.Other features of the new Asus laptop includes 00GB hard drive, 4GB of RAM, DVD SuperMulti writer, 2MP webcam, a 8-in-1 card reader, Altec Lansing speakers with SRS, HDMI, Gigabit LAN, USB 3.0, eSATA port, and Wi-Fi 802.11b/g/n. 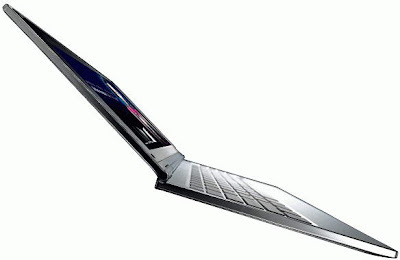 Asus N71JV-X1 notebook will be soon available with a price tag of about $899.99 and Asus N61JV-X2 with a price tag of $899. Tags:-16-inch, 16-inch notebook, 17-inch notebook, 17.3-inch, 17.3-inch notebook, ASUS, asus n61, Asus N61JV, Asus N61JV-X2, asus n71, Asus N71JV, Asus N71JV-X1, asus-notebook, Core i3 notebook, Core i5 notebook, Asus N61JV-X2 and N71JV-X1 Notebook price, Asus N61JV-X2 and N71JV-X1 Notebook features, Asus N61JV-X2 and N71JV-X1 Notebook specifications GeForce GT325M Notebook, Intel Core i3, Intel Core i5, N61JV-X2, N71JV-X1, NVIDIA GeForce GT325M, NVIDIA Optimus, NVIDIA Optimus notebook, NVIDIA Switchable Graphics, Switchable Graphics notebook, usb 3.0, USB 3.0 notebook, USB3.0. ViewSonic recently introduced the a new notebook to its ViewBook series of Netbooks, named ViewSonic ViewBook VNB105 Netbook.The notebook is based on Intel's Pine Trail flatform and aims mainly student users.ViewSonic VNB105 comes with a floating keyboard that provides for a smooth ergonomic feel. 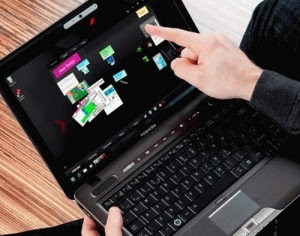 The all new ViewSonic ViewBook VNB105 netbook comes equipped with a 10.1-inch WSVGA TFT LCD display and is powered with 1.66GHz Intel Atom N450 Processor.The netbook includes an integrated GMA 3150 graphics. ViewSonic ViewBook VNB105 netbook includes a 1GB of DDR2 SDRAM and a 160GB hard drive.Other features of the new ViewBook includes a 7-in-1 card reader (SD, MMC, MS, MS Pro, MS Duo, RSMMC, SD Mini), Bluetooth, a webcam, three USB 2.0 ports, Gigabit Ethernet, WiFi 802.11b/g/n. 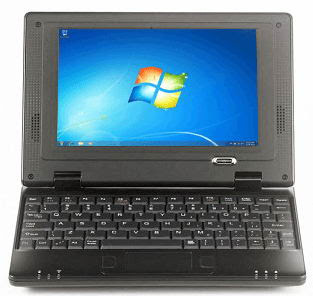 The ViewSonic ViewBook VNB105 netbook comes pre-installed with Windows 7 Starter OS.The netbook houses a 6-cell battery provides a back-up of about 8 hours.The ViewBook VNB105 netbook weighs 2.2 kg including the battery and its dimensions are 265mm x 24mm x 203mm (WxHxD). 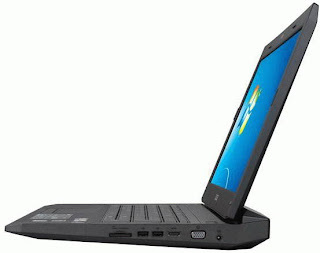 Tags:-10-inch netbook, 10.1-inch, 10.1-inch netbook, Atom N450 netbook, Atom netbook, Intel Pine Trail, netbook, pine trail netbook, ViewBook, Viewbook VNB105, ViewSonic, ViewSonic netbook, Viewsonic ViewBook, ViewSonic ViewBook VNB105, ViewSonic VNB105, VNB105, ViewSonic ViewBook VNB105 netbook features. Nokia recently announced the introduction of a special edition of its N97 Mini smartphone, named as Nokia N97 Mini Gold Edition.The main features of the new Gold Edition of Nokia N97 Mini is that it is covered with 18 carat gold.Other new feature is that the hand set is pre-loaded with multiple applications related to the “world of fashion” including the ELLE 360 Fashion news. 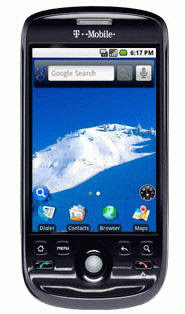 There is no change in the specification details when compared to normal edition.The new Nokia N97 Mini Gold Edition phone also equips 3.2-inch touchscreen TFT display with a resolution of 640×360 pixels and houses 5 megapixel camera, 16 GB internal memory, GPS, etc.The Nokia N97 Mini Gold Edition also runs on Symbian S60 5th Edition. The all new Nokia N97 Mini Gold Edition Smartphone will be available for a price tag of about $850 and is soon available in Europe, Asia, Africa and the Middle East markets. LG recently introduced its all new ultra-slim notebook, named the LG XNote X300.The notebook was first introduced at CES 2010 last month.The ultra slim LG XNote X300 notebook comes with a thickness of about just 17.5mm and weighs about 970g makes it a super slim and light-weight notebook. 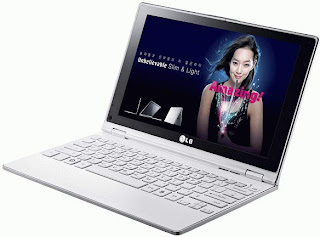 The all new LG XNote Mini X300 notebook comes with a frame-less LCD screen.The ultra-slim LG XNote X300 notebook equips a 11.6-inch LCD display with resolution of 1366×768 pixel and LED-backlight and an integrated GMA 500 graphics.The new laptop also houses a 1GB DDR2 RAM and a 64GB SSD. The new LG XNote X300 super-slim netbook comes available in two configurations named LG XNote Mini X300-LR80K and LG XNote Mini X300-LR10K.The basic difference is in the clock speed ie the LG XNote Mini X300-LR80K is powered with a 2GHz Intel Atom Z550 processor and LG XNote Mini X300-LR10K is powered by a 1.6GHz Intel Atom Z530 processor. LG XNote X300 notebook comes pre-loaded with Windows 7 Premium OS.The notebook also houses 802.11b/g/n Wi-Fi, Bluetooth, two USB ports, VGA, and a SD/SDHC/MMC card reader slot.The ultra-slim LG XNote X300 notebook is available in Shiny White color. The new LG XNote X300 Ultra Slim Notebook has a dimension of 298×186x17.5 mm.The LG XNote Mini X300-LR80K notebook will be available in Korean market with a price tag of 1,590,000 Korean Won and the LG XNote Mini X300-LR10K notebook is priced at 1,390,000 Korean Won. Tags:-11.6-inch, Atom netbook, Atom Z netbook, Intel Atom, LG Netbook, LG X300, LG X300-LR10K, LG X300-LR80K, LG XNote, LG XNote Mini, LG XNote Mini X300, LG XNote Mini X300-LR10K, LG XNote Mini X300-LR80K, LG XNote X300, LG XNote X300-LR10K, LG XNote X300-LR80K, Mini Laptop, Notebook, ultra slim netbook, Ultra Slim Notebook, Windows 7 netbook, LG XNote X300 Ultra Slim Notebook price details, LG XNote X300 Ultra Slim Notebook availability, LG XNote X300 Ultra Slim Notebook features, X300-LR10K. MSI now on ots way to launch its all new new X-Slim series notebook at the upcoming CeBit 2010.The notebook is named MSI X-Slim X360 will be featured with Core i5 processor.The new MSI X-Slim X360 Notebook is considered the first Notebook that uses Intel Arrandale notebook platform.The main feature of the notebook is its ultra slim design with just 1-inch thickness and weighs just 1.4kg. The MSI X-Slim X360 notebook equips a 13-inch 3D high-definition display efficiency and is powered with Intel Core i5 processor with Intel HM55 chipset as already mentioned.The new MSI X-Slim X360 includes Intel Turbo Boost and Hyper-Threading technologies that provides a long battery life of about 10 hours.More details and features of the MSI X-Slim X360 Notebook are yet to be revealed.. 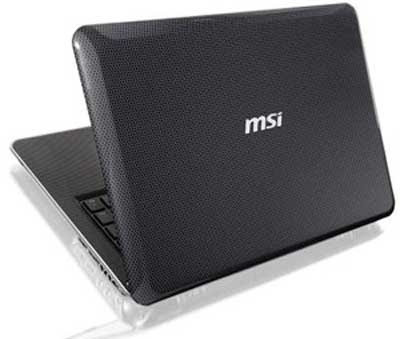 Tags:-13 inch, 13-inch notebook, Arrandale notebook, CeBit, CeBIT 2010, Core i5 notebook, Intel Core i5, MSI, MSI notebook, MSI X-Slim X360 Notebook features, MSI X-Slim X360 Notebook details, MSI X-Slim X360 Notebook specifications, MSI X-Slim X360 Notebook availability, MSI X-Slim, MSI X-Slim X360, MSI X360, Notebook, Slim Notebook, X-Slim, X-Slim notebook, X-Slim X360. Samsung recently made available its all new Smartphone, named Samsung Jet 2 in Indian market.The new Samsung Jet 2 is the newest of its Jet series mobiles which looks similar to original Samsung Jet S8000.But the difference is that the new Samsung Jet 2 comes with a lot more software features and an easy-to-use user interface. The all new Samsung Jet 2 Smartphone equips a 3.1-inch WVGA AMOLED touchscreen displayand is powered with a 800MHz processor.The handset has multitasking capabilities.Other features of the new Samsung Jet 2 Smartphone includes TouchWiz 2.0 UI, 5MP camera, Wi-Fi, DNSe & SRS Sound Effect technology, and GPS. Samsung Jet2 Smartphone also brings the Samsung’s Dolphin Internet browser.The Samsung Jet2 has one finger zoom feature.It also includes a 3D media gate UI, and support for browsing Web, viewing photos or PDF, TXT, and PPT files.The Smartphone from Samsung provides easily access to six key multimedia features including Music player, Photo album, Video player, FM Radio, Games, and internet. The Samsung Jet2 Smartphone now available in India with a price tag of 19,500 INR (about $420). Tags:- Jet 2, Jet II Phone, Jet2 phone, Phone, Samsung Jet 2 Smartphone price in india, Samsung Jet 2 Smartphone availability in india, Samsung Jet 2 Smartphone india launch, Samsung Jet 2 Smartphone specifications, Samsung Jet 2 Smartphone features, Samsung Jet 2 Smartphone images, Samsung Jet 2 Smartphone details, Samsung, Samsung India, Samsung Jet 2, Samsung Jet II, Samsung Jet2, Samsung Phone, Smartphone. Samsung recently announced the introduction of their all new full touch screen phone, named Samsung Monte S5620.The new Samsung Monte S5620 comes with easy access to social networking sites including Facebook, Twitter, MySpace, and Bebo.The handset runs on TouchWiz 2.0 plus UI (not Bada OS). The all new Samsung Monte S5620 comes equipped with 3.0-inch WQVGA LCD display with 16:9 landscape viewing and a 3.2MP camera with smile shot, face detection, and panorama shot function.The new handset comes equipped with Smart Unlock and One finger zoom. Other features of the Samsung Monte S5620 phone includes Wi-Fi and HSDPA connectivity, GPS, Exchange ActiveSync for Outlook, Google Sync, Google Latitude, Exchange ActiveSync, and full Internet browser.The Samsung Monte S5620 phone is expected to be presented at MWC 2010 and the price details will be revealed later..
LG Electronics recently introduced their all new mobile phone in Russian market, named LG GX200.The all new LG GX200 phone can equips dual SIM cards their by supports two networks simultaneously. 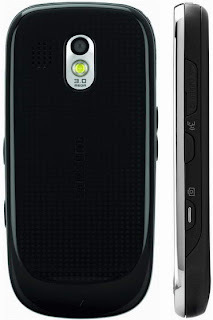 The all new LG GX200 comes equipped with a 2-inch TFT display with resolution of 176×220 pixels and features a 1.3 megapixel camera with flash light.The LG GX200 also comes included with 256 MB of integrated memory and houses a microSD memory card slot that supports up to 4GB memory. 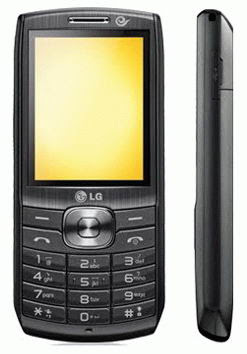 Other features of the LG GX200 phone includes Bluetooth 2.0, music and video players and FM radio.The handset also supports quad band GSM 850/900/1800/1900 MHz network.The new LG GX200 comes housed with a 1,500 mAh battery.The handset weighs 90g and its dimensions are 109×48x13 mm.The new LG GX200 comes with a price tag of about 3,990 rubles. Tags:-Dual-SIM, GX200, LG GX200 dual sim phone details, LG GX200 dual sim phone price, LG GX200 dual sim phone availability, LG GX200 dual sim phone launch details, LG, LG GX200, Phone. BenQ recently introduced the all new V Series LED display, considered to be the world's slimmest LED display.They introduced two LED display that belongs to the V Series, named BenQ V920 and BenQ V2220.Both the LED displays brings BenQ’s cutting-edge LED-backlight technology for outstanding image quality. The all new BenQ V920 comes equipped with a 18.5-inch LED display, 1366×768 resolution, 1000:1 contrast ratio, 250cd/m2 brightness, 5ms response time, and 170/160-degree viewing angle.The BenQ V920 comes available in two models, that includes BenQ V920 with anti-glare panel and the BenQ V920P with glare panel.The LED display also houses with DVI and D-sub inputs. 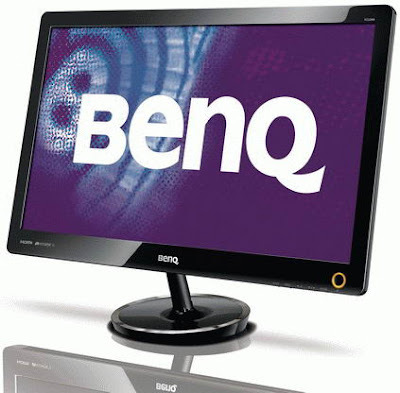 The new BenQ V2220 comes equipped with a 21.5-inch LED-backlit LCD display and support Full HD 1080p resolution.The LCD display from BenQ has a 1000:1 contrat ratio and 250cd/m2 brightness.The BenQ V2220 comes available in four models, includes the BenQ V2220 standard, the BenQ V2220P with glare panel, the BenQ V2220H with HDMI 1.3 input, and the BenQ V2220HP with both glare panel and HDMI port. Tags:- BenQ, BenQ LCD display, BenQ LED display, BenQ monitor, Benq V series, BenQ V2220, BenQ V2220H, BenQ V2220HP, BenQ V2220P, BenQ V2320, BenQ V2420, BenQ V2420H, BenQ V920, BenQ V920P, benq-lcd, Full HD display, Full HD LCD display, Full HD LCD-backlit LCD display, Full HD LED Display, LCD, LCD Display, LCD monitor, LED display, LED-backlit LCD display, slimmest LED display, V2220, V920. Vodafone has announced World's Cheapest Mobile Phones mainly aims sizeable and isolated rural populations in developing countries including India, Turkey and eight African countries including Lesotho, Kenya and Ghana.Accroding to experts vodafone will have to play with exchange rates in certain countries. at below $20 (Rs. 900), depending on the local market. HCL ME 40 has One Touch Support feature for better support and One Touch Recovery feature for faster data recovery by the user. 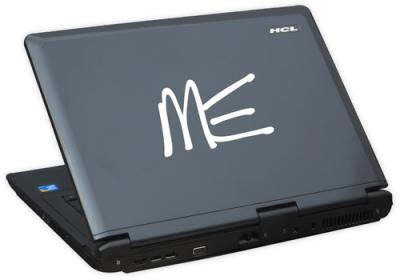 If the user wants to share/transfer a large amount of data from ME branded laptops, HCL offers 'SPLIT ME' option to do it rapidly. For data security, HCL offers Encrypt ME that encrypts the user data and 'LOCK ME' that locks the user data to protect against theft. Once enabled, it isn't possible for anyone to transfer, copy or write data from the encrypted system. It' s preloaded with Windows 7 Professional. Tags:HCL ME 40 notebook,hcl latop,hcl notebook, HCL ME 40 notebook features, HCL ME 40 notebook india details, HCL ME 40 india price, HCL ME 40 notebook price details, HCL ME 40 notebook availability, HCL ME 40 notebook images, HCL ME series notebooks, HCL ME series notebook price, HCL ME series notebooks specifications, HCL ME series notebook details. Samsung Australian division recently confirmed the introduction of their new Google Chrome OS notebook powered with 1.5GHz Qualcomm Snapdragon processor.Recent reports reveals that the new upcomming notebook will be similar to the Samsung N210. The new Google Chrome OS based notebook is expected to come equipped with a 10.1-inch display and features 2GB of RAM, 64GB Solid State Drive(SSD).The expected battery back-up of the new notebook is about 12 hours. 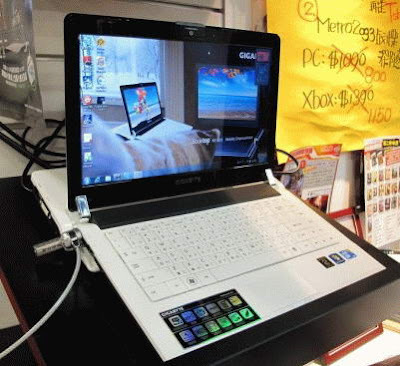 Samsung Chrome OS netbook is yet to be revealed.. Tags:- 10.1-inch, Chrome, Chrome Netbook, Samsung Chrome OS netbook features, Samsung Chrome OS netbook details, Chrome OS, netbook, Samsung Chrome OS netbook specifications, Samsung, Samsung Chrome, Samsung Chrome OS netbook. At 2010 MWC Barcelona Notion Ink presents a first prototype of its Tablet named Adam which has been developed by young professional in a start up firm Notion Ink in Hyderbad, India. Development of Adam is the result of 3 years of heard work of these young experts. With the launch of Adam, India yet again proved to the World a place for innovation at economic cost. 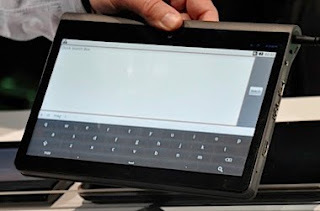 The Adam tablet measures measures 12.9mm and 11.6mm thick.It runs on a dual-core ARM Cortex A9 CPUs bearing Nvidia Tegra 2 SoC (System-on-a-Chip) running at 1GHz clock speed.The 10-inch Transreflective LCD PixelQi touch screen supporting 1024x600 pixels.The PixelQi consumes less power & supports full color along with a Black & White mode.Another important feature is that it is capable of displaying 1080p video playback. Notion Ink claims that Adam offers 16 hours of web browsing & also provides a 160 hour run time in backlighting off mode.Adam tablet will have Firefox and Chrome web browsers to support.It comes with multiple operating system support - Android, Ubunty and Chromium.The Adobe Flash Player 10.1 support will exist for better web browsing experience.It also has a 3.2 megapixel swivel video camera which can rotate 360 degrees and lined with auto focus. Apart from the above mentioned features the only difference with apple's ipad is that it weighs more & don't have the multi-touch supporting display with IPS technology. Tags:Notion Ink's Adam Tablet, adam,notion ink, Tablet,Touchscreen,Adam Tablet,ipad like tablets,ipad like,Notion Ink. Gigabyte recently introduced its all new gaming laptop, named Gigabyte M1405.The notebook was introduced at the recent Taipei Game Show.The new Gigabyte M1405 is considered as a more compact version of the Gigabyte M1305. with resolution of 1366×768 pixel and is powered with Intel Core 2 Duo SU7300processor.The new Gigabyte M1405 gaming laptop comes with either an Intel GMA 4500MHD integrated graphics or a GeForce GT220 graphics card. The new Gigabyte M1405 gaming laptop comes available in three color options.Other features of Gigabyte M1405 laptop includes 4GB of RAM, a 500GB hard drive (5400 rpm), and DVD drive. The main features of the new Gigabyte M1405 notebook is that it is included with two batteries, a 6-cell 3,600mAh battery and an additional 2,550mAh lithium-ion polymer battery.No reports are available about the battery life and price details. Tags:-14-inch, 2010 Taipei Game Show, dual battery, gaming laptop, Gigabyte, Gigabyte M1405, Gigabyte notebook, M1405, Gigabyte M1405 gaming laptop features, Gigabyte M1405 gaming laptop specs, Gigabyte M1405 gaming laptop battery. Dell recently made available in US market their new high-end widescreen LCD Monitor, named Dell UltraSharp U2711.The new Dell UltraSharp U2711 LCD Monitor is provided with a 100% coverage of sRGB color space and 96% of Adobe RGB. The Dell all new UltraSharp U2711 comes equipped with a 27-inch screen with resolution of 2560×1440 pixels in a wide aspect 16:9 ratio and properties including 6ms refresh rate, 1000:1 contrast ratio (80000:1 Dynamic Contrast Ratio), and 350 cd/m2 brightness. 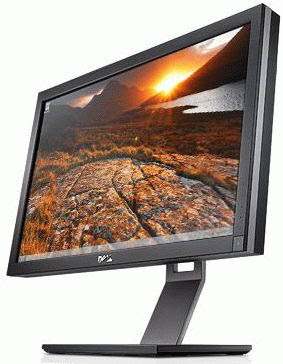 New UltraSharp U2711 widescreen display from Dell also comes housed with 8-in-1 media card reader, four USB 2.0 ports, D-Sub, two DVI, HDMI 1.3, DisplayPort and a composite connector.The new Dell UltraSharp U2711 LCD monitor is available with a price tag of $1099. Tags:-Dell, Dell Monitor, Dell U2711, Dell UltraSharp, Dell UltraSharp U2711, LCD, LCD monitor, monitor, U2711, UltraSharp U2711, Dell UltraSharp U2711 LCD monitor price, Dell UltraSharp U2711 LCD monitor features. Pioneer Computers Australia recently made available for pre-order their all new ultra-mobile PC, named DreamBook Lite E79.The notebook comes in lightweight and slim nature along with shockproof feature. According to manufacture, it is new internet device that suitable for Skype, Web Browser, Email, Youtube, Ebook, Media Player, Photo Frame, and Word/Excel/PPT. 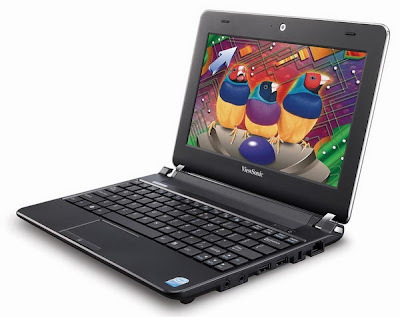 The all new Pioneer DreamBook Lite E79 netbook comes equipped with a 7-inch display with resolution of 800×480 pixels and is powered with Samsung 533 MHz ARM processor.The new Pioneer DreamBook Lite E79 netbook runs on Windows CE 5.0 OS. 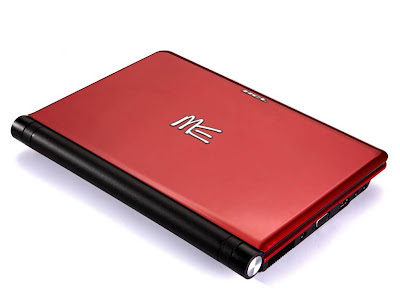 The Pioneer DreamBook Lite E79 netbook comes housed with 128MB of RAM and 2GB flash memory (up to 32GB of Secure Digital card), 10/100 Ethernet port, Wi-Fi 802.11b/g, and optional 3G module.The notebook weighs just 0.80kg and its dimensions are 214×145x32 mm. The new Pioneer DreamBook Lite E79 netbook is already available for order with a price tag that starts at $175 and additional $90 provides you the netbook with 3G module. 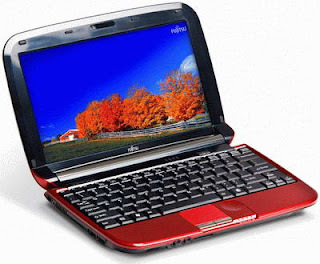 Tags:-DreamBook Lite E79, netbook, Pioneer, Pioneer Computers, Pioneer DreamBook Lite E79, Pioneer DreamBook Lite E79 netbook price details, Pioneer DreamBook Lite E79 netbook availability, Pioneer DreamBook Lite E79 netbook specifications, Pioneer DreamBook Lite E79 netbook features. Canon recently bring to sales their latest digital camera that belongs to the Rebel family, named Canon EOS Rebel T2i.The all new Canon Rebel T2i dSLR camera includes Canon’s DIGIC 4 Imaging Processor and an Enhanced iFCL 63-zone Dual Layer Metering System. The Canon EOS Rebel T2i DSLR camera comes equipped with a 3-inch Clear View LCD monitor with full-screen support and 3:2 aspect ratio.The new dSLR camera from Canon also houses an 18.7MP CMOS (APS-C) sensor with Full HD 1080p resolution at 30fps of video capture. The Canon Rebel T2i camera has feature ISO from 100 to 6400 (expandable to 12800). 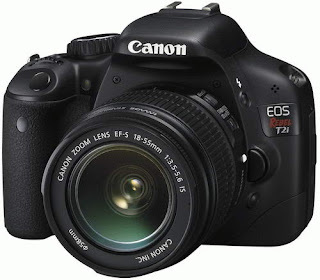 The Canon Rebel T2i camera will be available for sales in US market by first weeks of march 2010 with a price tag of $799.99 (body only) or with a price of $899.99 for Canon EOS Rebel T2i DSLR camera with Canon EF-S 18-55mm f/3.5-5.6 IS zoom lens. 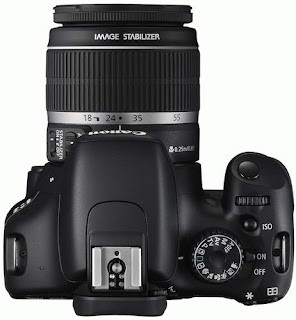 Tags:-Camera, Canon, Canon Camera, Canon EOS Camera, Canon EOS Rebel T2i DSLR camera price details, Canon EOS Rebel T2i DSLR camera features, Canon EOS Rebel T2i DSLR camera availability, Canon EOS Rebel, Canon EOS Rebel T2i, Canon Rebel, Canon Rebel T2i, dslr, EOS Rebel T2i, Rebel T2i. The aspiring medicos who appeared for the exam and cleared it will be soon called for counselling, where they would be allotted MS or MD seats in government colleges across the country based on their ranks. tags: aiims pg result,medical pg results,pg medical results,aiims medical entrance result 2010,aiims pg entrance results,pg medical entrance results. Philips recently announced the introduction of their new dual SIM hand set for Russian market, named Philips Xenium X100.The new Philips mobile belong to the Philips Xenium series, features a greater battery life of about a month in standby mode and up to 7.5 hours in talk time. The all new Philips Xenium X100 made of candybar form factor.The handset equips a 1.8-inch display with a resolution of 128×160 pixels.The new Philips Xenium X100 is capable of work simultaneously with two SIM cards.Other features included with the low costPhilips Xenium X100 dual SIM handset includes built-in MP3 player, LED flashlight, FM tuner, WAP support, and a microSD card slot that supports up to 2GB of memory. 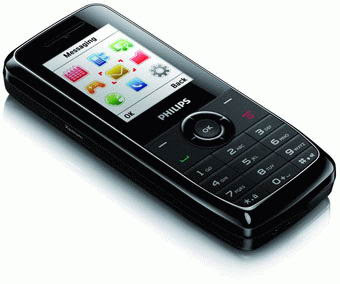 The Philips Xenium X100 phone weighs 85g and its dimensions are 102.8×43.8×14.9 mm. The phone comes included with a 1,150 mAh lithium-ion battery provides a greatet back-up as already said.The all new Philips Xenium X100 dual SIM handset will come to sales by this month with a price of about 2,000 rubles. Tags:-budget phone from philips, philips low cost phone, Dual-SIM, Philips, Philips Phone, Philips X100, Philips Xenium, Philips Xenium X100, Philips Xenium X100 dual SIM handset price details, Philips Xenium X100 dual SIM handset availability, Philips Xenium X100 dual SIM handset features, Xenium X100. Toshiba recently rleased the details of their new touchscreen Satellite for the UK market, named Toshiba Satellite U500-1EX.The new Toshiba Satellite U500-1EX built on Intel Calpella platform.The notebook comes with a glossy black keyboard. The all new Toshiba Satellite U500-1EX notebook comes equipped with 13.3-inch TFT TruBrite touchscreen display with resolution of WXGA (1280×800 pixels) and has multitouch support.The new Toshiba Satellite U500-1EX is powered with 2.13GHz Intel Core i3-330 CPU and includes an Intel HM55 Express Chipset. Other specifications of the new Toshiba Satellite U500-1EX notebook includes 4GB of DDR3 RAM, 320GB hard drive, integrated Mobile Intel HD Graphics, a DVD burner, HD widescreen web camera with Face Recognition, Wi-Fi 802.11 b/g/n, and Bluetooth. The new Toshiba Satellite U500-1EX notebook is available pre-loaded with Windows 7 Home Premium OS.The notebook weighs about 2.2 kg.Its expected that the new Toshiba Satellite U500-1EX will be available in UK market soon and is expected to come up with a price tag of £649 (about $1,000). Tags:-13.3-inch laptop from Toshiba, intel calpella, multitouch, Notebook, Satellite U500-1EX, toshiba, Toshiba Multitouch Notebook, Toshiba touchscreen Satellite U500-1EX Notebook price, Toshiba touchscreen Satellite U500-1EX Notebook availability Toshiba Satellite, Toshiba Satellite U500, Toshiba Satellite U500-1EX, U500-1EX notebook from toshiba. 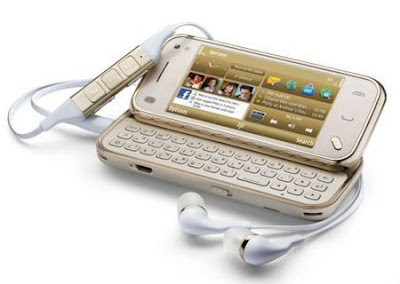 T-Mobile now on its way to release new updated myTouch 3G (aka HTC Magic).The new Updated T-Mobile myTouch 3G phone comes added with a 3.5mm headphone jack, an 8GB memory card, and a pre-loaded Swype keyboard. Other features were similar to original T-Mobile myTouch 3G phone which includes a 3.2-inch touchscreen display, 3.2MP camera with video capture and autofocus, Bluetooth, Trackball 4-way, GPS, 3G, and Wi-Fi. 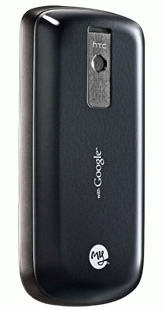 The new Updated T-Mobile myTouch 3G phone also upgraded its RAM to 288MB, the previous were just 192MB.Other inclusion consists of Google Search by voice app, and Google Maps Street View app.The T-Mobile myTouch 3G phone weighs 4.1 ounces and its dimensions are 2.2×4.5×0.6 inches. The all new Upgraded T-Mobile myTouch 3G phone included with a 1340 mAh Lion battery provides up to 16 days in standby time and almost 7 hours of talk time.The all new T-Mobile myTouch 3G phone with 3.5mm headphone jack has costs at $149.99 with 2-year contract. 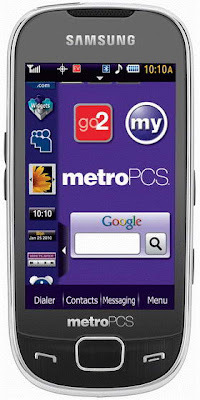 Tags: -Android, Android Phone, Android smartphone,Updated T-Mobile myTouch 3G phone price details, Updated T-Mobile myTouch 3G phone details, Updated T-Mobile myTouch 3G phone images, 3G google Android, gphone, HTC Android Phone, HTC G2, HTC Magic, HTC Magic G2, HTC Phone, HTC Smartphone, myTouch, myTouch 3G, myTouch 3G 3.5mm jack, Phone, Smartphone, T-Mobile, T-mobile Android, T-Mobile G2, T-Mobile HTC Magic, T-Mobile Magic, T-Mobile myTouch, T-Mobile myTouch 3G. 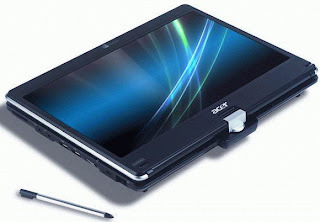 Acer recently introduced their new Acer Aspire 1420P convertible tablet notebook in France.The notebbok is yet to be introduced in US market.The new Acer Aspire 1420P convertible tablet notebook comes pre-loaded with Windows 7 Home Premium OS. The all new Acer Aspire 1420P convertible tablet notebook comes equipped with an 11.6-inch touchscreen display with resolution of 1366×768 pixels and is powered with 1.2GHz Intel Celeron SU2300 processor.The convertible tablet also includes integrated GMA 4500MHD graphics. The new Acer Aspire 1420P (1420P-233G25n) convertible tablet notebook houses 3GB of RAM and 250GB hard drive.The new convertible tablet notebook from Acer also features 802.11b/g/n Wi-Fi, Bluetooth 2.1 + EDR, HDMI and VGA outputs, webcam and a 5-in-1 card reader. Acer Aspire 1420P notebook included with a 6-cell battery that provides up to 6 to 8 hours of battery life.The all new New Acer Aspire 1420P (1420P-233G25n) convertible tablet notebook is available in France with a price tag of about 499 Euros (about US$688). 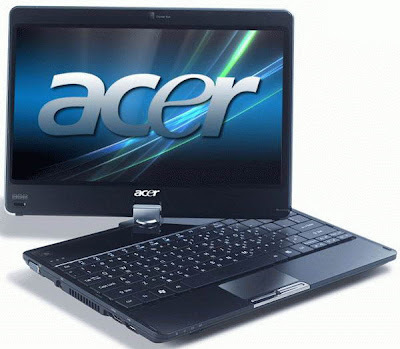 Tags:-acer, Acer Aspire, Acer Aspire 1420p, Aspire 1420p, Acer Aspire 1420P convertible tablet notebook price, Acer Aspire 1420P convertible tablet notebook features, Acer Aspire 1420P convertible tablet notebook images, Acer Aspire 1420P convertible tablet notebook specifications, Acer Aspire 1420P convertible tablet notebook availability, Acer Aspire 1420P convertible tablet notebook launch details. Nokia recently starts the sale of its first netbook in UK market, named Nokia Booklet 3G.The notebook was introduced in August last year.The all new Nokia Booklet 3G netbook is available in UK market with a price of £649, which is around $1011.The Nokia Booklet comes with aluminum finished body. The all new Nokia Booklet 3G netbook comes equipped with a a 10.1-inch HD glass display powered with 1.6GHz Intel Atom Z530 processor.The notebook also houses 1GB RAM, and a 120GB hard drive for storage.Other features of the new Nokia Booklet 3G netbook includes HDMI, a webcam, A-GPS, Ovi Maps, Wi-Fi and a SIM slot for 3G connectivity. The new Nokia Booklet 3G netbook comes pre-loaded with Windows 7 Starter Operating system.The 3G netbook from Nokia is included with a battery that is capable of providing up to 12 hours of battery life. 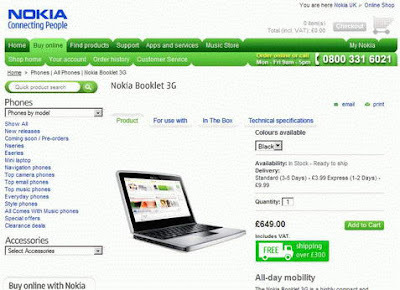 Tags:-10.1-inch, Booklet 3G, netbook, Nokia, nokia booklet 3G, Nokia Booklet 3G netbook UK price, Nokia Booklet 3G netbook availability, Nokia Booklet 3G netbook features, Nokia Booklet 3G netbook price details. Western Digital recently introduced a new hard drive with SATA 6.0 Gbps interface, named the Western Digital Caviar Black SATA 6.0 Gbps (WD1002FAEX).The all new Western Digital SATA 6.0 Gbps HDD comes available with a storage capacity of 1TB. Other featues of the new 1TB HDD from Western Digital includes a 3.5-inch hard drive, 64MB of buffer memory, 7200 rpm, and as low as 33 dBa sound output.The all new 1TB Western Digital SATA 6.0 Gbps HDD is already available in Japanese market with a price tag of $118 (85 Euro). 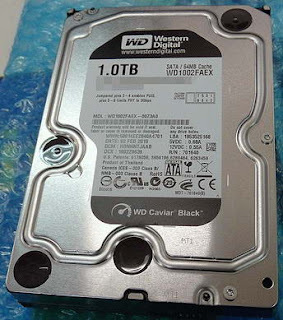 Tags:-Western Digital HDD, SATA 6.0 Gbps, WD, WD Caviar Black, WD Hard drive, WD SATA 6.0 Gbps, Western Digital, Western Digital 1TB HDD, Western Digital Caviar Black, estern Digital 1TB HDD price, estern Digital 1TB HDD details, estern Digital 1TB HDD availability. ASUS recently started the sales of their all new gaming laptop in US market, named ASUS G73JH-X1.The all new ASUS G73JH-X1 gaming notebook is designed as a mobile gaming station. The new ASUS G73JH-X1 gaming laptop comes equipped with a 17.3-inch LED backlight display with Full HD resolution of 1920×1080 pixels and is powered with 1.66GHz Intel Core i7 720QM Quad-Core processor with Turbo Boost.The new gaming notebook from Asus also houses an ATI Radeon HD 5870 GPU with 1GB of GDDR5 memory. ASUS G73JH-X1 gaming laptop supports 8GB of RAM and 500GB hard drive with 7200 rpm.Other features of the ASUS G73JH-X1 gaming laptop includes a DVD writer, Wi-Fi 802.11 b/g/n, a 2MP web camera, 8-in-1 card reader, four USB ports, and HDMI port. The all new ASUS G73JH-X1 gaming laptop weighs about 3.6 kg including the 8-cell lithium ion battery and its dimensions are 415×320x20-50 mm.The notebook comes pre-loaded with Windows 7 Home Premium 64bit OS. Asus G73JH-X1 gaming notebook is equipped with a DVD writer, Wi-Fi 802.11 b/g/n, a 2MP web camera, 8-in-1 card reader, four USB ports, and HDMI port. 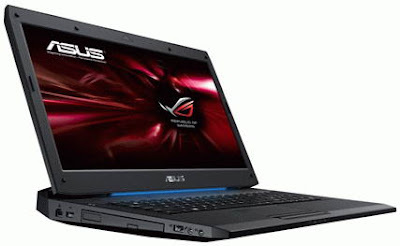 Dimensions of Asus G73JH-X1 are 415×320x20-50 mm and weight is about 3.6 kg (with 8-cell lithium ion battery).Asus G73JH-X1 gaming notebook comes with a price tag that starts at $1,449.99. Tags: -17.3-inch, ASUS, asus asus g73jh-x1, asus g series, asus g73jh, asus g73jh-x1, asus gaming notebook, asus-notebook, Asus G73JH-X1 gaming notebook price, asus g73jh-x1, asusg-series, Asus G73JH-X1 gaming notebook avaialbility, asusg73jh, asusg73jh-x1, asusgseries, G-Series, g73jh, Asus G73JH-X1 gaming notebook details, Asus G73JH-X1 gaming notebook specifications, gaming laptop, gaming notebook, gaminglaptop, Notebook. HP recently unveils its all new ProBook series of notebooks, named HP ProBook 6440b and HP ProBook 6540b Notebook PC.Both the ProBook notebooks are powered with Intel Core i5/i7 processor and houses ATI Mobility Radeon HD 4550 GPU with 512MB of VRAM graphics. The new HP ProBook 6440b notebook comes equipped with 14-inch LED-backlit display with anti-glare and 1366×768 resolutions while the HP ProBook 6540b notebook equipped with a 15.6-inch LED-backlit display with anti-glare and resolution of 1366×768 pixel. The all new HP ProBook 6440b and 6540b notebooks comes included with 500GB hard drive or 128GB SSD, HP Mobile Broadband (powered by Gobi) with GPS, Wi-Fi 802.11a/b/g/n, Bluetooth 2.1, and four USB 2.0 port.Both notebooks from HP supports up to 8GB of RAM. 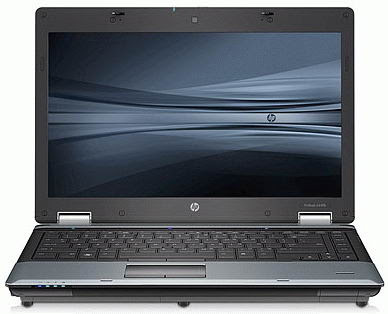 HP ProBook 6440b notebook is available with a price tag that starts with $919 and the new HP ProBook 6540b notebook price starts at $959. 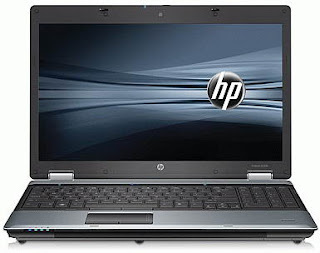 Tags: -14-inch, 15.6 inch, HP, HP 6440b, HP ProBook 6440b and 6540b Notebooks features, HP ProBook 6440b and 6540b Notebooks specifications, HP 6540b, HP ProBook, HP ProBook 6440, HP ProBook 6440b, HP ProBook 6540,HP ProBook 6440b and 6540b Notebooks price details, HP ProBook 6540b, Notebook, ProBook. LG Electronics recently unveils their all new LG KV230 candybar phone in Chinese market.The new LG KV230 handset comes in candybar form factor and aims at music lovers.The new LG KV230 looks almost similar to folding model of LG GU230.LG KV230 is designed for CDMA EV-DO Rev.0 network via China Telecom. The all new LG KV230 Phone comes equipped with 2.4-inch TFT display with a resolution of 320×240 pixels.The other features of LG KV230 Phone includes 2 megapixel camera, music player, FM radio and a microSD memory card slot. The LG KV230 low-cost music Phone comes housed with a 950 mAh battery.The handset weighs 95g and its dimensions are 116×52x14.7 mm.The price details and availability of the all new LG KV230 are yet to be revealed. 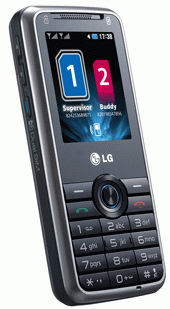 Tags: candybar phone, candybar version of LG GU230, LG KV230 low-cost music Phone details, China, China Telecom, LG KV230 low-cost music Phone features, KV230, LG, LG KV230, LG music phone, LG KV230 low-cost music Phone specifications, LG phone, music phone, Phone. 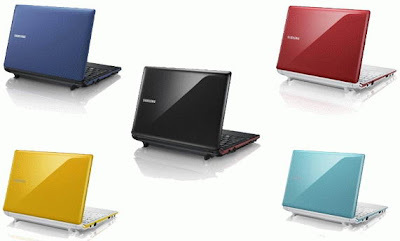 Samsung recently updated its Pine Trail-based netbook, the Samsung N150 netbook with three new colors.With the introduction of three new attractive tropical set of colors the range increased to seven colors. 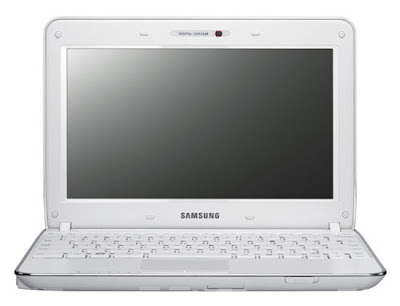 The whole specification remains unchanged with a 10.1-inch display, powered by 1.66 GHz Intel Atom N450 CPU, a GMA 3150 graphics, 1GB of RAM, and a 160GB hard drive.There is an increase in the price of about 10$ for the new shaded Samsung N150 netbook.The new Samsung N150 netbook with Bermuda Blue, Flamingo Pink, and Caribbean Yellow comes with a price tag of $359 and is already available for pre-order. Tags: 10.1-inch, add colors, Intel Pine Trail, N150,Samsung N150 netbook new colors, Samsung N150 netbook new colors netbook for pre-order, Samsung, Samsung N150. Fujitsu recently started the sale of their all new Fujitsu LifeBook MH380 netbook in US market.The notebook is based on Pine Trail is introduced last year.The new Fujitsu LifeBook MH380 netbook comes pre-loaded with Windows 7 Starter OS. The all new Fujitsu LifeBook MH380 netbook comes equipped with a 10.1-inch HD display and is powered with 1.66GHz Intel Atom N450 processor.The Fujitsu LifeBook MH380 also includes an integrated Intel graphics. 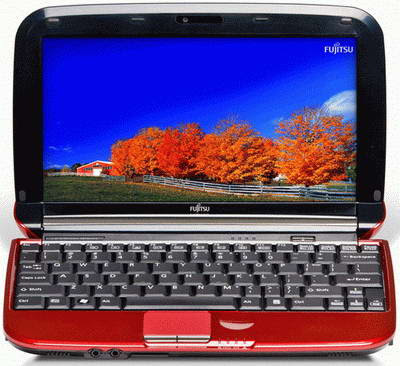 The new Fujitsu LifeBook MH380 netbook features 1GB of DDR2 RAM,250GB hard drive,a 1.3MP camera, a SD card reader, Atheros Wi-Fi 802.11b/g/n, Bluetooth 2.1 with EDR, an Ethernet port, and Glossy Ruby Red housing. Fujitsu LifeBook MH380 netbook houses a 6-cell 5800 mAh Lithium ion battery and is available in US market with a price tag of $449. Tags:- 10.1-inch, Fujitsu, Fujitsu LifeBook, Fujitsu LifeBook MH380 netbook features, Fujitsu LifeBook MH380 netbook configuration, Fujitsu LifeBook MH380 netbook specifications, Fujitsu LifeBook MH380, Fujitsu MH380, fujitsu netbook, fujitsu pine trail netbook, Intel Pine Trail, LifeBook MH380, MH380, netbook, now on sale, pine trail netbook, Fujitsu LifeBook MH380 netbook price details. Recent news reveals that Sony Ericsson XPERIA X10 will be debut on Vodafone UK in April 2010.Sony Ericsson XPERIA X10 is considered to be the first Android smartphone from Sony Ericsson.The Sony Ericsson XPERIA X10 sports 1GHz Qualcomm Snapdragon and is based on Android 1.6 platform. The all new Sony Ericsson XPERIA X10 phone comes equipped with a 4-inch full wide VGA touchscreen display and includes an 8.1 megapixel autofocus camera with 16x zoom lens.The new XPERIA X10 has a 1GB internal memory and also houses a microSDHC card slot for expanding memory up to 8GB. 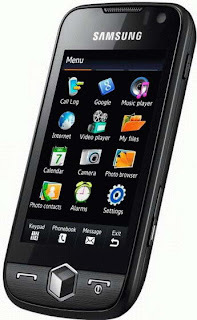 Other features of Sony Ericsson XPERIA X10 includes a built-in GPS, Wi-Fi, and Bluetooth connectivity.The handset weighs 135g and its dimensions are 119×63x13 mm.The price details and the exact launch date of the new Sony Ericsson XPERIA X10 Phone is yet to be revealed..